New this week Revealing mistake: When they demo (and drop) the thermal lance, a wooden table flips on its side in the chaos. Immediately afterwards you can see a linear actuator they used to flip the table attached to one leg. 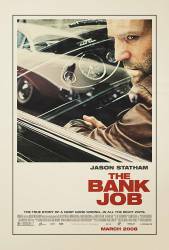 Factual error: We see Jason Statham walking into a shop in 1971 which has a Visa/Barclaycard logo on the door. Only problem with that is that the name Visa wasn't brought in until 1977. Factual error: In the end credits, the characters are grouped into categories - the category "THE VILLAINS" is misspelled as "THE VILLIANS". Factual error: When Terry makes a phone call to the garage to see if Eddie is ok, Ingrid the receptionist tells him that unless he wants to see Eddie again he must call a number beginning with 01946. However, in 1971 the entire area code of London began with 01, it wasn't changed until May 1990 where it split into 2 different area codes. As the film is only taking place in London involving all characters, the area code doesn't need to be given unless Lew Vogel was elsewhere. Factual error: At one point there's a shot of the entrance to Baker Street underground station with directions to the Hammersmith and City Line. This did not exist in 1971 - then it was called the Metropolitan Line. Factual error: One of the guitarists in the wedding band at Eddie's wedding reception is playing an RKS guitar. This guitar was not introduced to the market until 2005. Factual error: In the scene where you see the underground train arriving in Tottenham Court Road station, the train has a red front. Only one unit of the stock in question had/has that combined with the original silver livery, and it never ran in service with it. Not to mention the fact that it wasn't applied until 2000, if not later. And the first trains used in service with red fronts rolled out of the shops in the 1980s, and this film is set in 1971. Factual error: They did not sufficiently warm up the end of the thermic lance either time they used it. The welding rods must be at melting point prior to turning on the oxygen - this would take considerably longer than the couple of seconds they took. Factual error: They dig a tunnel in West London and should therefore be tunneling through London Clay. But the substance they tunnel through isn't London Clay. The actual crime scene photos in the 'Bonus Features' also show London Clay. Furthermore, the substrate that they do tunnel through would require shoring, but none is used. Factual error: Michael X said that he was going to Trinidad to "liberate his people." This is rather misleading and gives the impression that Trinidad was still a British colony. Trinidad and Tobago gained its independence from the United Kingdom on 31 August 1962 so whatever people he had there were already liberated. Also, when the MI5 agent went to Trinidad to check the whereabouts of Gale Benson, he should not have had the power to order the police to burn down any building as Trinidad and Tobago is not subject to the powers of The Crown. Suggested correction: This is not a mistake. It is based on real-life events. He means that he wants to liberate his people from oppression, as there was still an atmosphere of racism throughout the British colonies. Factual error: The radio amateur uses the Revox tape recorder "B77" to record the radio conversations. This model came on the market in 1977, and the film is set in 1971. Factual error: It's not just the Mercedes that is "ahead of its time" - one of the police Jaguar XJ6's has an M registration, i.e. August 1973 on. It also had visibly rusty door bottoms! -so much for all the vehicles being immaculate. I didn't see the registration on the Jaguar E-type confiscated by the debt collectors, but it was a Series 3, only introduced in March 1971 - so it had a remarkably fast journey to Terry Leather's dodgy used car lot. Gale Benson: Hakim, tell us more about your book. Hakim Jamal: It's about being born black in America. Can any of you imagine what it's like to be a black man in this world? Can any of you white women imagine what it would be like to bring a black baby into this world?